My family is always looking for something fun and exciting to entertain us on the weekend. We love being outdoors and activities that are challenging, but driving to the mountains or braving crowds can be exhausting. We have driven by the zip lines on I-70, but haven’t stopped. They look like so much fun, but I am usually in a “get me home and off this road” mindset when we pass. This winter I heard a zip line was being built in Castle Rock, so as soon as it opened, I scheduled a Castle Rock zip line tour. No one in my house was more excited for the Castle Rock zip line than my eight-year-old daughter. Secretly, I was concerned that the equipment would be too complicated for her, or the 50 mph speeds might be too frightening, but her reaction suggested she was ready. Since everyone was eagerly anticipating the zips, I really hoped the weather would cooperate. They say online that they operate in all conditions, but I don’t like to ski when the weather’s hitting my face and I doubt I ski anywhere near 50 miles per hour! We couldn’t have asked for a nicer day! Don’t make the mistake of climbing the incline only to discover that the Castle rock zip line tour headquarters is actually inside the Phillip S. Miller Park recreation center. A few people in our group climbed the incline thinking it was the meeting place- it’s not. The iconic, last ride of the tour is at the top of the incline, but we registered inside the center. We had filled out waivers online, so we just checked in and waited. Right on time, our guides fitted us and drove us to our first stop. Having an ATV drive us up the hill was a relief! We didn’t bring water (it is encouraged you do), and I worried my kiddo would tire before we even started. The Castle Rock zip line tour does require about a mile of hiking in-between lines, but it is easy enough and the anticipation of each zip is a great distraction. Before the first Castle Rock zip line, we practiced steering and stopping on a short wire, a few feet off the ground. This alleviated my fears and gave my daughter even more confidence. The lines increase in both length and speed as the tour progresses. The first Castle Rock zip line is relatively short, and because we were beginners, it was also really uncomfortable! The guides suggested they might be adjusted for comfort, but the harnesses didn’t fit snug around our legs. Do yourself a favor, and pull the harness as tight as it will go around your thighs. The first few lines were actually painful until one of the other riders suggested we pull the straps tighter. My daughter is a lean 70 pounds, and we couldn’t tighten the straps for her. She said it never felt comfortable. Luckily, she had so much fun, she forgot about it while she was zipping. Before we knew it, we had completed most of the Castle Rock zip line tour! I could have zipped for hours more because the tour is surprisingly relaxing. The zip was so well coordinated and led that I never questioned the safety. This is a huge deal given the amount of risk involved with skimming a metal cord, fifty feet off the ground, at 50 miles per hour. The guides were great, the scenery was beautiful, and each line was exciting. Like any good story, the climax is near the end. 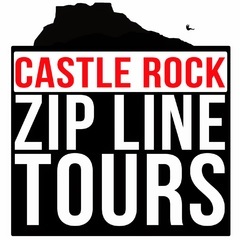 The final Castle Rock zip line is the longest in Colorado and the fastest of the tour. The 9th line ends near the incline descent, so we didn’t actually climb up the stairs at all. Part of the fun of the final run was racing my daughter and the other part was the idea of going down without braking. It’s fast! Even though the auto-brake was jarring, it was great speeding down the line next to my kid, with reckless abandon. The tour was three hours of money well spent.